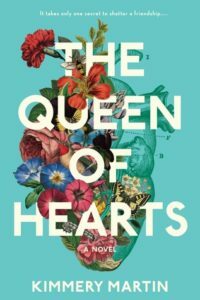 The Queen Of Hearts by Kimmery Martin came out earlier this year and instantly got a lot of buzz. I got myself on the waitlist for it at the library, and when it came in, I jumped on it. The Queen Of Hearts is about two friends – Emma and Zadie – who met in med school. They now live in Charlotte NC, where Zadie is a pediatric cardiologist and Emma is a trauma surgeon. They’re both married with kids, and their lives are knitted together socially and professionally as they enjoy their successful careers. Then – dum dum DUM – a man from their past re-enters the scene, and all havoc breaks loose. Emma loses a young patient, perhaps due to her own negligence, while Zadie copes with the appearance in Charlotte of this man from her past and all of the memories he unearths. While the events of the present day unfold, Martin takes us back to the women’s med school years, showing us how their friendship has evolved and slowly revealing the secrets they’ve been keeping from each other. The Queen Of Hearts gets a big meh from me. Lots of foreshadowing and buildup for a twist that was both implausible and underwhelming. Lots of medical drama and jargon that ultimately did little to advance the plot but certainly showed off that the author is also a doctor. I think Martin didn’t know whether she wanted to write a medical drama, a thriller or a book about friendship, so she wrote all three at once. In the end, it was a thin amalgamation that didn’t really satisfy on any front. I found it hard to finish this one. Lots of people liked this book – many 5 star reviews on Goodreads and glowing posts on the interwebz. So maybe it was just me (and my best friend, who felt the same way.) Proceed at your own risk. Posted on June 12, 2018 by gayle. This entry was posted in Fiction and tagged kimmery martin, the queen of hearts. Bookmark the permalink.